The Berkeley Public Schools Fund is hosting a very grassroots effort to improve the prospects of local immigrant families through the establishment of a new scholarship to continue to support students as they pursue their education. 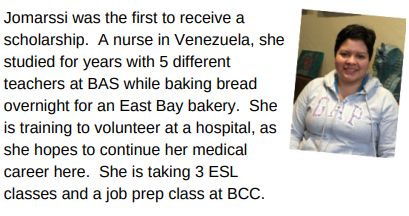 The BAS-ESL Scholarship was created by Jann Sweenie, a retired ESL and Spanish teacher, who served for 34 years at both Berkeley Adult School and Peralta Community Colleges. 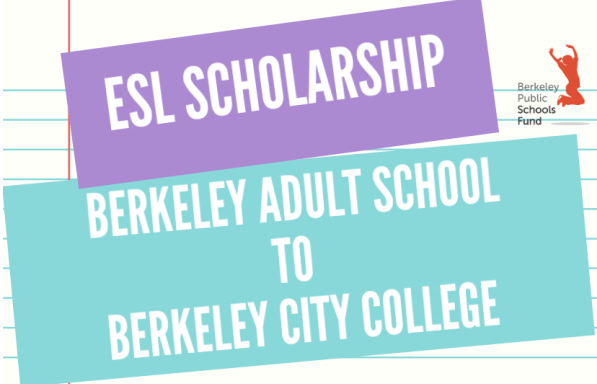 This scholarship serves to assist immigrant students who have successfully completed ESL courses at BAS as they advance to Peralta Community Colleges to further their education goals. 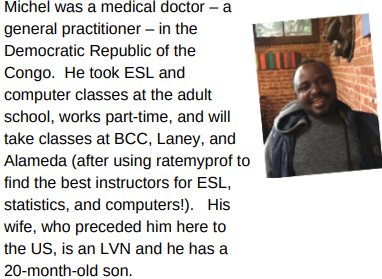 Although ESL classes at Berkeley Adult School are free, if students wish to continue their education, community college classes are not free. As most BAS student have access to very limited resources, financial aid may not be enough and the scholarship is meant to support students for one or two semesters with additional money for textbooks, materials, and possibly transportation costs. If you are interested in learning more about ways in which the BPSF supports student achievement in general or if you would like to contribute to this scholarship, please go to: www.berkeleypublicschoolsfund.org and click “Donate Now” at the top of the home page. On the page that comes up, after filling in your information, under the Program tab, select “other” and type in “BAS-ESL Scholarship.” You can also donate by a check made out to: Berkeley Public Schools Fund and write BAS-ESL on the memo line. Please mail your check payments to: BPSF, PO Box 2066, Berkeley, CA 94702. All donations are tax deductible, and you will receive a personal handwritten “Thank You” note from Jann Sweenie, along with periodic updates about the students who benefit from the fund.